Welcome back to Covers from the Unknown on another Happy Friday! If you are a regular of this weekly column, you will know last week I gave you some Black Adam advice! This week, I pull a 180, and give you some Shazam! Just like Black Adam, Shazam has very few variants out there. What that means, is when the movies come out, and people start looking for these hard to find variants, you better be ready! This week I present to you Justice #5, the 2nd print variant, by Alex Ross. 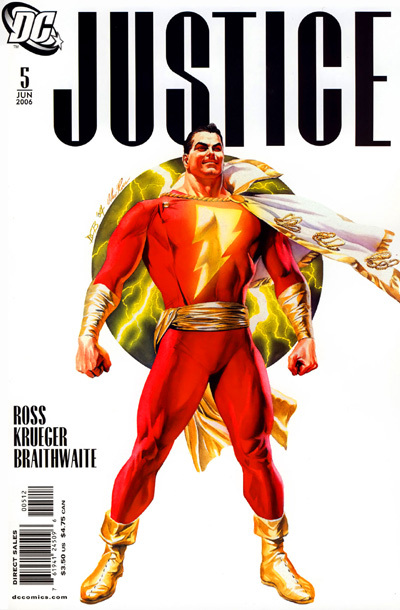 Amazing Shazam cover, from June 2006. Hmmmm…didn't we already have a Ross Black Adam cover???? Here is where we get to the good part. The Justice series had very big print runs, with most being over the 100k mark. BUT….and I will emphasize this, all the 2nd print covers were under 2k. #5 comes in at 1,700. I am not sure how many of these are out there in the wild, but online they are very scarce. Also, to note…for now, they are all over the board. I have seen these as low as $3, and as high as $30. If you can find them for cheap, I would grab one or two. In the long run, I guarantee you will be happy with this decision! Sorry Jason, I didn’t say thanks for the post, so thanks man! I came across a Tony Daniel Black Adam cover whilst searching for this and the Black Adam’s mentioned in the post last week. It is JUSTICE LEAGUE OF AMERICA #7.4 BLACK ADAM 2D COVER. Is this a variant, a subsequent print or what? And I am new back into the game as of last year, so I am confused by what the .4 means, seen it on some Spiderman comics too, the decimal point I mean. A couple years ago DC did a whole month of Villians covers. There were 3D covers and cheaper 2D covers. Out of the gate the 3D covers were hot as they were allocated. The 2D covers were easy to get. A few months later they did 2nd printings of the 3D covers, which kind of cooled down the heat on the 1st printings. So the first print 3Ds have some value and the 2Ds are readily available. Great looking book, thanks Jason. And never mess with a guy wearing gold boots. Come on Jon! What are you gonna do with all your extra money?? You cant save it! Go buy em! I had a copy originally and just bought another online for 4$. Woot!! Mind helping out a fellow comic collector and pointing me in the right direction to find one? Looked on eBay and can’t find one copy. Thanks!!! Hey Andy, may wanna try amazon. I did see two there last night! Good luck! Appreciate the help. Currently all sold out on Amazon. Not gonna give up the search!!! Thanks!!! Saw two at an online retailer for $3.50 each both are now gone. What do you think about that Hero/Villain split cover 3rd print by Ross?